Gelatin Has Left the Building. – Sweet & Sara Marshmallow Review and Giveaway! Sara from Sweet & Sara was kind enough to send us a Marshmallow Variety Sampler, which contained four of each marshmallow flavor (vanilla (which we pronounce vaneeya), toasted coconut, cinnamon pecan, and strawberry), to taste test and review. She will be sending one lucky winner a Marshmallow Variety Sampler as well! All four flavors are “deeee eeeee lissssh us” and have a great texture. Our favorites, however, are the coconut and cinnamon pecan flavors. These marshmallows are great just by themselves straight out of the refrigerator. The vanilla and coconut flavors are also great for making Vegan s’mores. They melt and get all gooey mmmmmm. They are especially good if you have access to Rice Milk bars (we HIGHLY suggest Terra Nostra’s Ricemilk Choco Bar). We have not tried making s’mores with the other two flavors but we are sure they would be vair tasty too. And if you don’t feel like making your own s’mores? Then Sweet & Sara has you covered with their Original and Peanut Butter flavored S’mores. They are good cold, at room temperature, or heated up. Our favorite is the Original but the Peanut Butter variety is also nom worthy. You might be saying to yourself right around now “Wow, that is a lot of tasty looking products. There is no way they could have even more.” If so, you would be wrong! This is one of the times it pays to be wrong though so don’t worry :D. S&S now offers mini vanilla marshmallows that could go great with some Vegan hot chocolate or maybe you could add them to a bowl of cereal :D. And finally there is the Rocky Road Bark which has a big bite. Wozzie used to own and run her own Shoppe and she sold S&S marshmallows and s’mores. They were some of the best selling items in the shoppe! Woz says that Sara was great to deal with too. We would like to end the review by begging Sweet & Sarah to bring back the Mexican Chocolate flavored marshmallows. Please, please, please, please Sara!! Now for the giveaway. To enter leave a comment telling us your favorite Sweet & Sara marshmallow flavor. If you have not tried any of the flavors let us know which one you look forward to trying the most. Is one entry not quite enough for you? Then follow us on Twitter (we are HHVeganos) and Tweet about the giveaway. Then make another comment on here linking to your Tweet to get a second entry into the contest. The winner will be chosen at random. Winner will be chosen on Friday, November 27. Good luck to all of you! Sorry, contest is for the USA only. I’m a big fan of the toasted coconut, but would love to get my hands on the cinnamon pecan to put on top of sweet potato mash for Thanksgiving! I’ve never tried these before. The Cinnamon Pecan sounds out of this world! I’ve never tried ’em but have been dying to do so for a while now! Cinnamon Pecan sounds awesome. I’m dying to try the strawberry flavour. Sounds gorgeous. I love, love, love the vanilla marshmallows, and I think it would be absolutely heavenly to have some minis for hot cocoa! My favorite Sweet and Sara marshmallows are the coconut. I’d love to try all the other flavors! I’ve only tried the regular, but the cinnamon pecan is calling my name! Today I made sweet potatoes with the cinnamon pecan marshmallows for an early Thanksgiving… amazing. One of my friends declared them the best marshmallows he’s ever had. High praise all around. They’re the only kind I’ve had so far but I can’t wait to try more! Strawberry sounds delicious! Mmmmmmm!!!!! Sweet & Sara coconut marshmallows send me on a tropical vegan delight holiday!! Ay ay ay!! 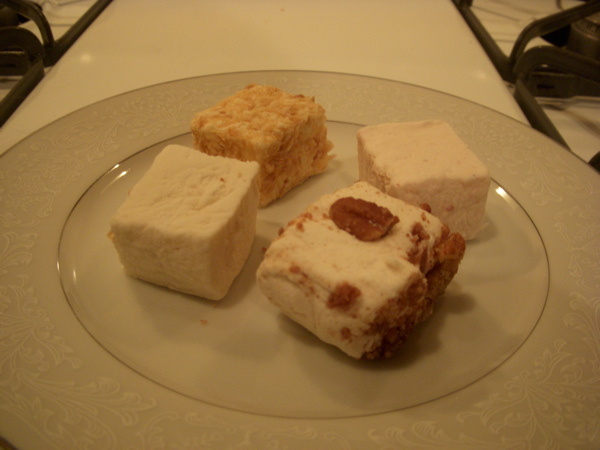 I have never tried Sweet & Sara marshmallows, but I would love to try the Cinnamon Pecan. Thanks! I have never tried Sweet & Sara, but all the flavors sound delicious! The cinnamon pecan flavor is very intriguing. I haven’t had a marshmallow since I went vegan almost 4 years ago. I hope I win! I’ve only had plain but I’m dyyyyyyyying to try that cinnamon pecan flavor!! I’ve never had them but can’t wait to try vanilla!! yummmy. strawberry s’mores are in my future. It’s hard to pick just one, but the toasted coconut is my favorite! I have never had the pleasure of trying one, I am dying to try the Cinnamon Pecan! Oh, I can only choose one! But, I want to try them all. Ok, how about… cinnamon pecan. I also retweeted your tweet! i’ve only had vanilla marshmallows, plain smores and the PB smores. OHMYGAWD!!! the PB smore was insanely good. the layer of peanut butter was such a good idea! it reminded me of this cookie i had in my youth, but i never remember the name of it. it was amazingly good. Love the original S’mores as well but above all I love Sweet & Sara! Ohhh, I want to try the cinnamon pecan ones. Please? I have never tasted a vegan marshmallow in my life. I would be most honored and humbled to try a vegan vanilla one. The Strawberry Marshmallows have me drooling. I haven’t tried them but Cinnamon Pecan sounds so good! I haven’t tried them yet, but the strawberry ones sound delightful! Have never tried any of them but the coconut sounds amazing! I’ve only tried the vanilla and coconut, but would loooooooove to get my hands on the strawberry marshmallows! I love these marshmallows, even though I’ve only had them once (the vanilla). I bet the coconut would be really good, but what I really want is to try them all! My favorite is the vanilla marshmallows! They are great in S’mores! I love the cinnamon pecan ones; they are the perfect balance of sweet and nutty. Sweet and Sara are the best marshmallows! I’m dying to try Cinnamon Pecan! The cinnamon pecan is possibly my favorite but I can’t resist the toasted coconut either! The original Vanilla is what I want to try the most! I LOVE vanilla anything – best flavor EVER!